The Julia Cardigan has been on my to-do list for quite some time. It is such a fun cardian with a nice drape and three different sleeve options. There are several things I like at Indiesew but one of my favorites is the creations. Here other Indiesew users can upload their creation and you can see how their garment looks. Plus see the all the versions and the type of fabric they used. Let's talk about pattern specifics and start with size. This one runs very true to size my measurements put me right at a large, , except for the hips, I am a medium. I find the fit spot on. The pattern has 2 shoulder options, one for this extended shoulder like I made in this animal print jersey. I thought the extended shoulder would be perfect for summer, just a little cardigan for to fight off the air conditioning chill. Plus the animal print is great to add to an outfit, right? My only suggestion would be for the collar. If your fabric is printed on, then order enough to do the double over collar. Double over is the term used by the pattern designer and it means to cut 2 of the collar. Then you have a lined collar. This is a better finish for the collar. In this photo below, you can see the cardigan blowing in the wind and the wrong side of the fabric showing. My fabric is from Fabric Mart, purchased during one of the great jersey knit sales. I have wanted a bit of animal print and this cardigan was just the right pattern. I usually only order 2 yards of a knit but if you make the double over collar options you need 2-1/8 yards. I just wasn't able to squeeze the second collar out of my yardage. You can check out the chart for the various yardage requirements, note how the longer sleeve options are listed as extra yardage. A long sleeve, double over cardigan needs 3 yards of fabric. 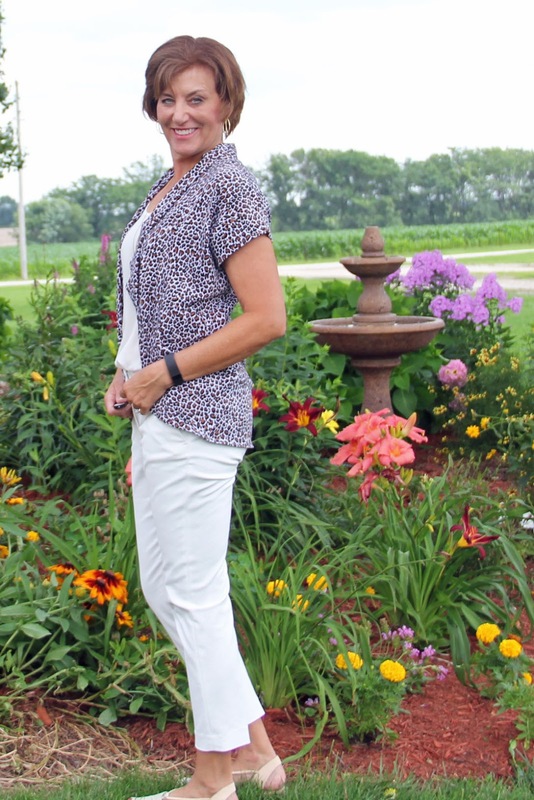 I really like my new Julia Cardigan, it is so stylish and fun to wear. A big plus is it is a very fast sew with cutting and sewing I finished this in 2 hours. Now I just had to pose in my flowers, they are just so pretty this year. Lots and lots of rain has helped my garden grow. Thanks, Mary Ellen, it is a quick sew and I think with 107 degrees you should stay in and sew! That is a great little cardigan for summer. Love it! Thanks, Stacy, it will be a fun one. I think it's cute Lori and love in that animal print. Thanks Faye, it is the perfect amount of animal print I think. 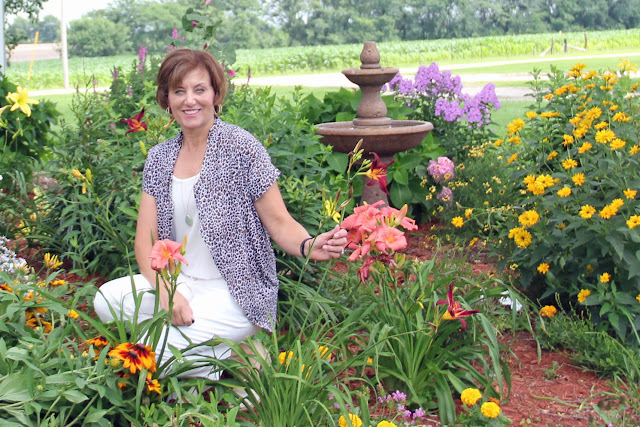 Your cardi looks great and your flower garden looks wonderful! Thank you, Coco, I really need to make a few more. Great summer cardigan. This one definitely is going on my sewing list. Thank you, Rose, I love this one. Pretty cardigan and love the style line. It looks great on you. Every time I go to grab a cardigan in my closet I don't have one. I definitely need to add this to my wardrobe. Beautiful! I love your cardigan! I downloaded this a few months ago but haven't made it yet. I love every version that I see. Thanks, Levone, it is so hard to make everything, isn't it? I have several pdf patterns to make!